Proclamation on May 20, in 1935 declaring that day and in each succeeding year to be “Massachusetts Lafayette Day”. May 20, 1834, was the date of Lafayette’s death. The bronze plaque both commemorates the 100 anniversary of the Lafayette’s visit (1824) and names the mall where it stands “The Lafayette Mall.” The plaque was dedicated in 1924 in Parkman Plaza, part of the Boston Common (Tremont Street, near Park Street). Plaque and Bas-Relief by John Francis Paramino. The sculpture is mounted on top of a base constructed of stone blocks. A plaque is attached to each side of the base. By Arnaldo Torcchi. Dedicated Sept. 17, 1932. In 2004, the interior and exterior of the statue were removed, restored, and returned to Lafayette Square Corner of Winter & Essex Streets. 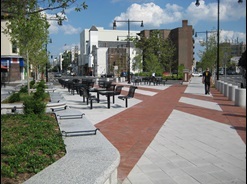 Amesbury, MA – Lafayette St. Ext. Caritas Communities, MA – Lafayette St.
Chicopee, MA – Lafayette St.
Fairhaven, MA – Lafayette St.
Lawrence, MA – Lafayette St.
Marblehead, MA – Lafayette St.
New Bedford, MA – Lafayette St.
Newburyport, MA – Lafayette St.
Salem, MA – Lafayette St.
Swansea, MA – Lafayette St.
Wakefield, MA – Lafayette St.
Worcester, MA – Lafayette St.
A marble bust of LaFayette is located in the Senate Chamber of the Massachusetts State House 24 Beacon Street, Boston, MA. The Durfees would host Lafayette at their home in the summer of 1778, as well on other occasions. Colonel Joseph Durfee, the son of Judge Thomas Durfee served with the Marquis de Lafayette at the Battle of White Plains, NY and also in Rhode Island. 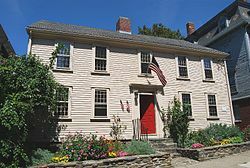 The Lafayette-Durfee House (built before1750) is a historic house located at 94 Cherry Street in Fall River, Massachusetts. 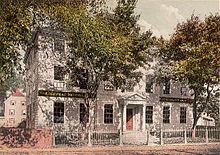 The house was originally located at the site of the current Fall River Superior Courthouse on North Main Street. 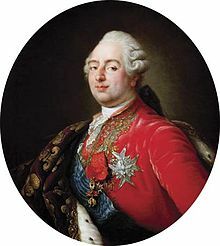 General La Fayette embarked on L’Hermione at Port-aux-barques near Rochefort, France on March 11, 1780, and arrived in Marblehead near Boston on April 28 carrying the secret news that he had secured French reinforcements (« Expédition particulière »: 5,500 men and 5 frigates) for the American Insurgents of George Washington. *Lafayette received an honorary degree from Harvard University, Cambridge, MA. 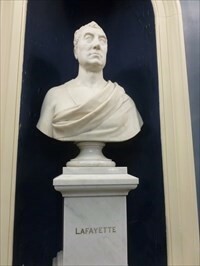 -Lafayette received a portrait of Washington from the city of Boston, MA. 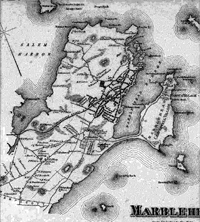 In 1784, Lafayette visited Marblehead. He came particularly to honor General John Glover, who fought with him in the American Revolution and also to see his friend Elbridge Gerry an American statesman and diplomat. On August 26 he stopped in five Massachusetts cities and towns: Lexington, Concord, Salem, Marblehead, Newburyport and settled into the Boston area until August 31. Hamilton Hall plaque which reads: In Memory of Major General Marquis de Lafayette, Soldier, Statesman, Citizen of France and of the United States. When Lafayette and his son, George Washington Lafayette came to Marblehead in 1824, though his friends Glover and Gerry were no longer living Lafayette’s affection for the town remained constant. As did the town’s feelings for him. They both visited Mary Glover Hooper, the daughter of John Glover. As a part of his welcome, a large and beautiful coach pulled by six white horses awaited him, and he was driven around the streets of Marblehead. Dinner was served at the Lee Mansion, owned at this time by the Bank of Marblehead. The Jeremiah Lee Mansion is a historic house located at 170 Washington Street in Marblehead, Massachusetts. Today, it is operated as a house museum by the local historical society. The house acquired this name due to an often-told story that when General Lafayette visited Marblehead in 1824, his carriage, a coach pulled by six white horses was too large to pass by the house and so the corner of the building on the first floor was removed. BUT…The story is considered unlikely by modern historians and there are other possible explanations for why the house is missing a corner. To allow large coal wagons to pass by, or that it was constructed that way for a retail shop entrance, or to allow the flow of draining water and sewage. On June 1825, Lafayette is back in New England. A monument commemorating General LaFayette’s visit to Worthington, MA in 1825 is located in front of the Worthington Library. 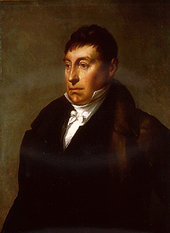 June 17, 1825, Lafayette begin his second New England Tour. He lays the cornerstone of the Bunker Hill Monument during the celebration of the 50th anniversary of the Battle of Bunker Hill, in Charlestown, Boston, MA. He is accompanied by Daniel Webster, who gives a rousing speech. On June 23, He spent the night in Dover, N.H. That night, a delegation of citizens from South Berwick, Maine, invited him to breakfast. He accepted. Then he visited Biddeford and Portland. On June 28, Early in the day, he crossed over the Cornish Bridge to Vermont, passing through Woodstock late in the morning, then took a stagecoach over the mountains to Barnard and Royalton, Randolph and Barre. He spends the night in Montpelier at The Pavilion. On Wednesday, June 29, 1825, he left Montpelier for Burlington, his last stop in New England.